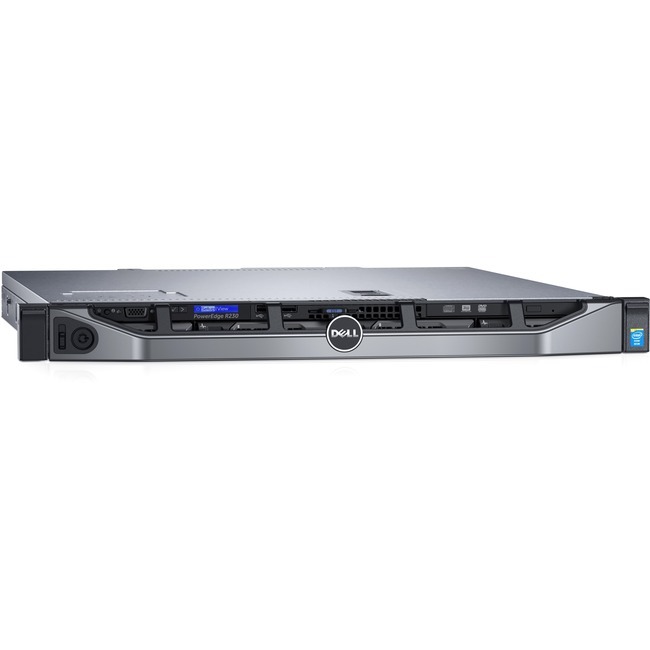 The Dell EMC PowerEdge R230 is an excellent first server or replacement server for driving applications in SMB. Compared to the previous-generation PowerEdge R220, the R230 delivers greater memory capacity, more hard drives and I/O slots, and accelerates data throughput and IOPs performance. The R230 also supports the full-featured, remote management of the integrated Dell Remote Access Controller (iDRAC8) with Lifecycle Controller, making it highly attractive for ROBOs of large institutions. Accommodate data growth over time with up to four internal 3.5- inch cabled or hot-plug hard drives. Expand memory capacity with four DIMM slots supporting up to 64GB of DDR4 memory to drive application performance and fast response times. Adapt flexibly to changing workload conditions with a virtualization-ready server supporting Microsoft® Windows Server® with Hyper-V® and VMware® vSphere® ESXi®. Accelerate compute performance across a wide range of applications with a processor from the latest Intel® Xeon® processor E3-1200 v6 product family. Drive 50% faster clock speed with enhanced DDR4 memory compared to DDR3 which is 12.5% faster than the initial 2133 MT/s implementation of DDR4. Boost I/O data throughput with 2 x PCIe 3.0 slots driving 2x data throughput compared to PCIe 2.0. Deliver 2x IOPS performance with R230/PERC9 compared to the previous-generation R220/PERC8. Deploy smoothly and rapidly with Dell OpenManage systems management solutions. Easily monitor system health and behavior with the simple, intuitive OpenManage Essentials console. Gain additional levels of convenience and high-availability protection with hot-plug hard drives. The Dell OpenManage systems management portfolio includes innovative solutions that simplify and automate management tasks, making IT operations more efficient and more cost-effective throughout the server life cycle. Leveraging the incomparable agentfree capabilities of the embedded iDRAC with Lifecycle Controller, server deployment, configuration and updates are rapid and worryfree. Remote monitoring and control of the R230 is provided by OpenManage Essentials and can also enable anytime, anywhere mobile access, through OpenManage Mobile.